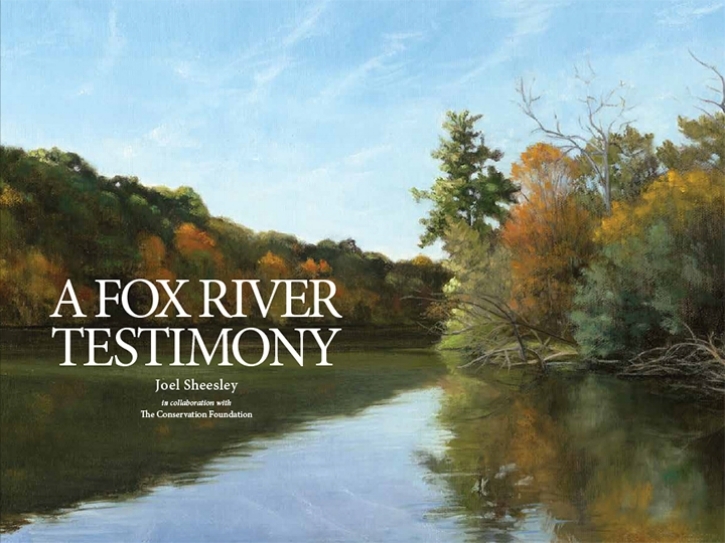 A Fox River Testimony, published by The Conservation Foundation in 2018, is a 160 page, full color book that reproduces all the paintings that were exhibited in “Joel Sheesley: A Fox River Testimony” at the Schingoethe Center at Aurora University from Sept. 20 - Dec. 14, 2018. A Fox River Testimony is not a collection of paintings; it is a journey, one that immerses readers in the ceaseless play of a river-carved landscape and its tributaries of meaning. Sheesley creates an intimate portrait of the everyday glory of these life-giving waters as they wend their way through forest, prairie, and city. He shows us how to face a river, open to the possibility of love. Readers will feel the humility of an artist who reverences the living landscape and wonders if he is up to the task of doing it justice. Open this book, enter its flow, and you’ll see for yourself that he does. Joel Sheesley’s A Fox River Testimony fills me with a sense of longing for this world, in all its moods and turns and sudden openings, and for something just beyond it, whispering through it. How did the painter know to place himself in just this relation to the river’s sheen and seams and secrets, and how did he quiet himself enough to respond so deeply and so well? I find myself asking this with each painting, as if learning to look and feel and love with this sort of embedded openness was not only what we were put on the earth to do, but as if now, finally, when it mattered most, I had someone willing to show me how. Through Sheesley's close attention to wind and weather, muskrats and mallards, slants of light, patterns of motion, and the contrasts between brokenness and beauty, we are drawn into the life of the river and the Illinois communities that push into its shoreline. His images and evocative words provoke a passion in us for the Fox River itself, and prompt a deeper desire to care for this and other vulnerable---and sometimes overlooked---places. Sheesley stunningly completes the task he has set for himself with this transformative project: "..to make what is visible evoke the invisible." Cindy Crosby, “The Tallgrass Prairie: An Introduction" and "Tallgrass Conversations: In Search of the Prairie Spirit." 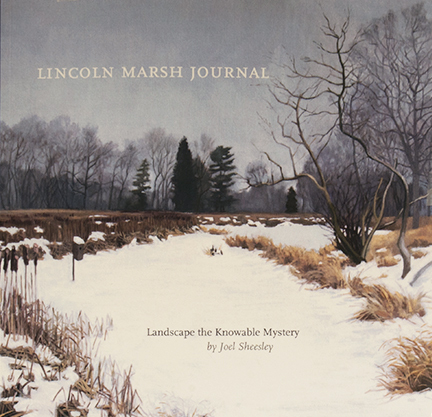 Lincoln Marsh Journal is a book that reproduces all the paintings that were exhibited in "Landscape the Knowable Mystery," an exhibition of Lincoln Marsh landscapes coordinated by the Wheaton Park District and the Billy Graham Center in 2015. My journal entries made while I was working on the Landscape the Knowable Mystery project are the text for Lincoln Marsh Journal. Images and text together give the reader a glimpse into my year of observation of the Marsh and reflection on its significance. Domestic Vision is the exhibition catalog from the 2008 retrospective exhibition of my work at the Brauer Museum at Valparaiso University. The book contains essays on my work by Lisa DeBoer, David Morgan, Wayne Roosa, Daniel A. Siedell, and E. John Walford. Sandino in the Streets was published in 1991 by Indiana University Press. My photographs of Nicaraguan political graffiti that feature Augusto Cesar Sandino are featured in the book along with excerpts of text taken from Sergio Ramirez' 1981 Augusto C. Sandino: El pensamiento vivo. Ernesto Cardenal wrote a prologue for the book and Jack W. Hopkins' essay gives context for the Nicaraguan Revolution of 1979. Wayne G. Bragg translated Sandino's writing, helped me make connections in Nicaragua, and partnered with me on the organization of the book. JOEL C. SHEESLEY AND WAYNE C. BRAGG, Sandino in the Streets, Bloomington: Indiana University Press, 1991. xxvi + 117 pp. ISBN 0-253-35207-x. Latin American Research Review, Vol. 29, No. 1, 1994, “Sandino in the Streets,” Review by Chuck Tatum. Sheesley’s essay, “The Image of Sandino in the Streets,” focuses on multiple levels of meaning in the thousands of public images representing Sandino. Sheesley notes that the composite image – made up of professional produced posters, stenciled images, and even hasty sketches – became a point of convergence for many national and political themes: “Calls to patriotism, to defense, to national integrity, to exercise the right to vote, to peace, to production, and to cultural and global awareness have all relied on the image of Sandino for support” (p.xxi). Before the FSLN insurrection of 1979, this image served as a sign of resistance and defiance of repressive established authority; later the Sandinista victory, the image was used to help consolidate revolutionary gains and to promote nationalism and pride. Sheesley comments perceptively on the different aesthetic meanings taken on by Sandino and his image. He is at once a folk hero and a national hero, a people’s symbol and a party symbol (p.xxv). As Sheesley observes, the appearance of Sandino’s image on walls, doors, and other public surfaces can be interpreted as artistic expression, historical witness, political propaganda, national hope, and even mythological longing.